NORTHCHURCH, England, August 18th 2015. 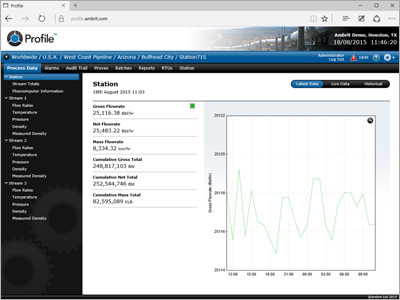 Profile™ SCADA software collects measurement and business data from the field and brings it all back to a centralized server where it can be viewed, updated and analysed using just a web browser. The data collected can also be passed to other systems for automated processing. New prove results collected by Profile™ can now be automatically transferred into Approve™, removing the requirement to manually re-enter data for more accurate data collection and to provide a comprehensive list of all proves performed on the system. FLOWCAL support has been expanded to include all remaining CFX sections including periodic data. CFX data can now be imported with the RTU details for easier setup. Profile™ can now print reports for any RTU to a specified printer rather than just one centralised printer. Meter runs on process data screens can now be reordered and all screens now dynamically adjust to filter unused data fields for a more flexible presentation of data. A new data retrieval mechanism has been introduced that allows Profile™ to be used with PLCs and other RTUs that do not have Enron style Modbus archives. This allows historical data to be retrieved using a standard Modbus map. Full compatibility with the latest Windows operating systems. Please contact Ambrit for more information about Profile™ v5.0 or upgrade options from your current version.